Classic lemon squares, made gluten free. 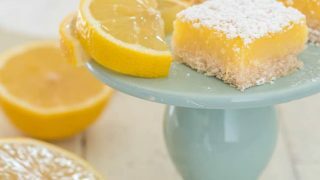 This gluten free lemon bars recipe has a buttery dairy-free shortbread crust with a velvety smooth lemon curd. 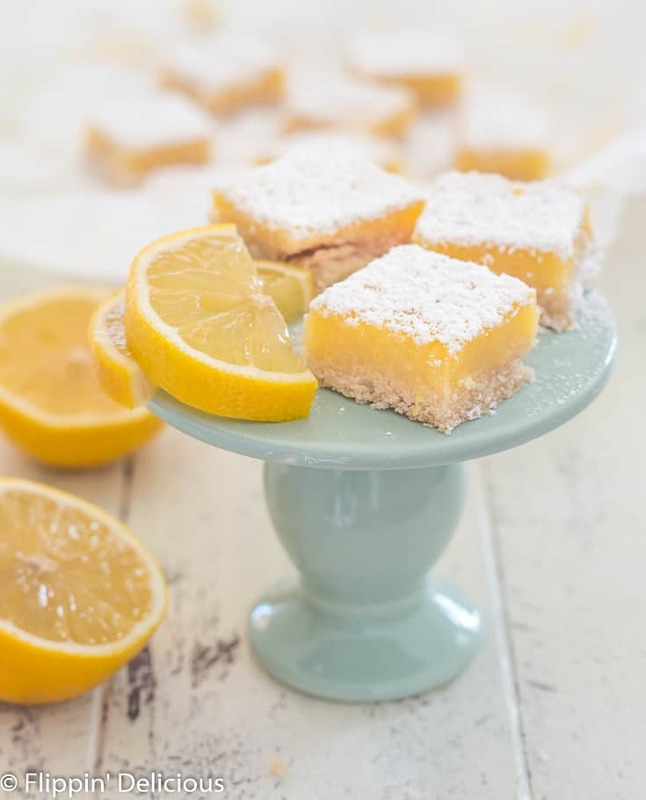 For me, creating the perfect gluten free lemon bar recipe was a Mecca of sorts. No, I didn’t go on an actual pilgrimage to bake these bright gluten free lemon squares, but it was a journey nonetheless. 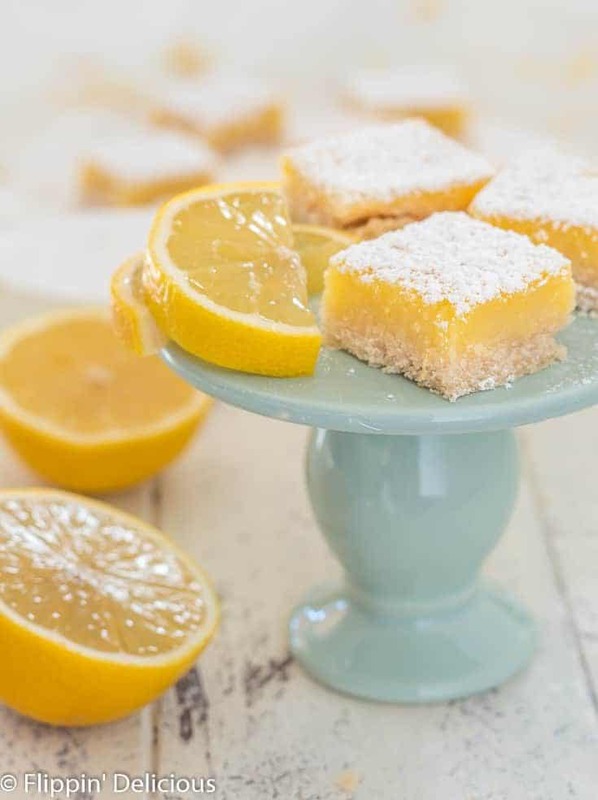 Lemon Bars were one of my favorite treats before I went gluten-free. I wanted to nail the recipe so it tasted just as good as I remember! This recipe was originally in my cookbook, The Essential Gluten-Free Cookie Guide. If you are a cookie fiend, like me, check it out. 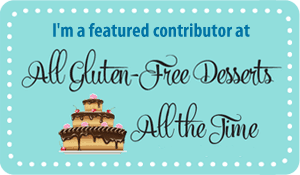 You’d probably also love my Gluten-Free Holiday Cookies cookbook. A buttery crust that can hold it’s own. Meaning, it is a rich a butter shortbread that isn’t a pile of crumbs. 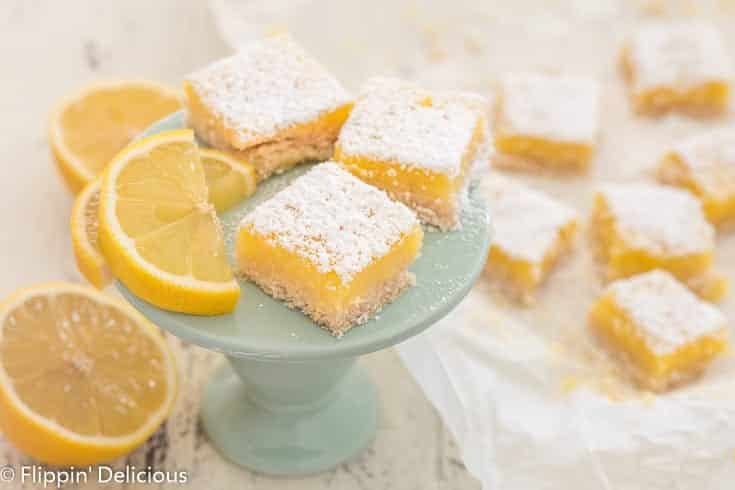 I want to be able to pick up a gluten free lemon bar between my fingers and enjoy it without grabbing a plate and fork. So many of the recipes I tried resulted in a pile of crumbs, or a chewy cracker. Neither of those results was acceptable to me. It is all about the lemon curd! I mean, they are lemon bars. If you don’t nail the lemon part, what is the point?!?! The lemon curd has to have the right balance of sour lemon and sweetness, while also having a smooth mouthfeel. I didn’t want it to have a chalky feel, or chunks. I want my lemon curd to be buttery and sweet, but not cloyingly sweet. That is a thin line to balance on! The lemon curd also has to hold it’s shape, while still being a curd. I don’t want lemon curd oozing out all over the sides of my gluten free lemon squares. Yet, it still needs to have a little fluidity because I also don’t want it to be like a layer of cake on top of a crust. It still needs to be a curd! If you are a big lemon curd fan like me, I bet you’ll love this gluten-free fruit tart. It is filled with lemon curd! It needs to be an EASY gluten free lemon bars recipe. I wanted to make my gluten free lemon squares the same way I did when I was a kid. I wanted to make the buttery gluten free shortbread crust, press it into the pan, and par-bake it while whisking together the lemon curd ingredients. After the gluten free crust is golden, I want to pour the lemon curd on the crust while it is still warm and pop it back in the oven to set. I did NOT want to pull out the blender, use nontraditional ingredients like cashews or almonds or tofu, or do a RAW lemon bar. 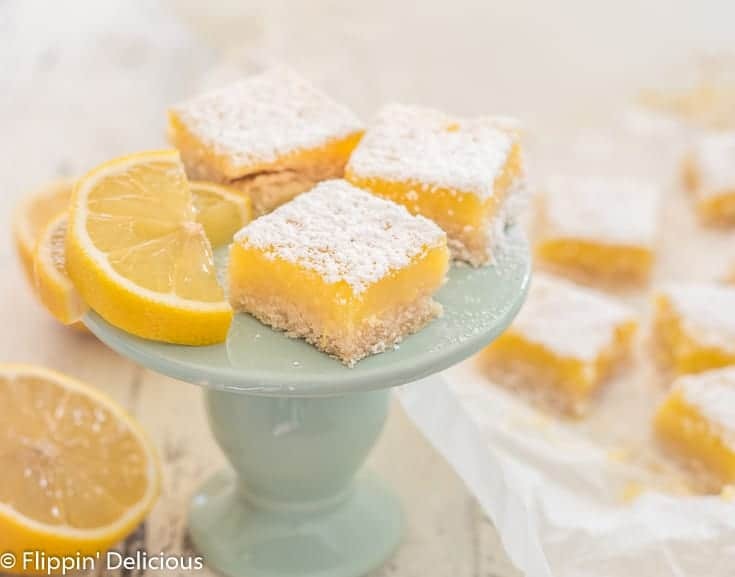 I wanted classic lemon bars-gluten free! Perfecting my gluten free lemon bar recipe to make it just right took a lot of time. As you can tell from my monologue, I’m a bit particular about my lemons bars. The biggest struggle I had was getting the texture right in the crust and the curd. Getting my crust to hold its shape and not be a pile of buttery crumbs, and also getting my curd to set without it becoming pastey. You can find an earlier version of this recipe with a raspberry twist in my gluten free raspberry lemonade bars recipe. 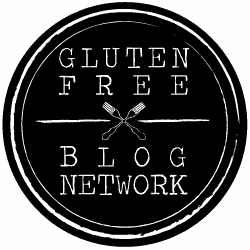 Here are my secrets to making the best gluten free lemon bars! Egg whites in the gluten free shortbread crust. I know, egg whites in shortbread is not traditional. In my recipe testing, it is the best way to give the gluten free shortbread crust the structure it needs without compromising the buttery goodness that is shortbread. Why should I use powdered sugar in gluten free shortbread crust? I know you may feel silly pulling out powdered sugar for the crust and white sugar for the filling, but let me tell you why you should. The powdered sugar has just a wee bit of cornstarch in it (meant to prevent clumping) which adds a bit more structure to your gluten free crust. If you were to add granulated sugar, it would make your shortbread crust more tender. Normally that is a good thing when you are making cookies. But specifically with gluten free shortbread based cookies I have found much better results when using powdered sugar. They hold together better, and still have a delicate and butter bite. Measure the gluten free flour for the curd carefully. It is important to add flour so that your gluten free lemon squares set correctly, but if you add too much they will have a pasty or chalky texture, instead of that smooth velvety lemon curd that I (and hopefully you) crave. I know, it is incredibly tempting. You have that big bottle of lemon juice sitting in your fridge and it would be so easy to use just that and skip the zest. If you don’t get enough juice from your lemon, go ahead and supplement with that lemon juice bottle from your fridge but don’t forgo the fresh zest lemon unless you like just slightly lemony squares. The sugar quickly dissolves into the lemon curd, so don’t try and sprinkle the powdered sugar ahead of time. Especially it you are taking your gluten free lemon squares to a potluck or picnic, you may find a dusting wand handy. You can also use a sieve or even a tea ball. It is essentially a little wire ball that you can fill with powdered sugar and then quickly dust your lemon bars, among other things. I’ve got a picture of one near the end of the post, just before the pin. 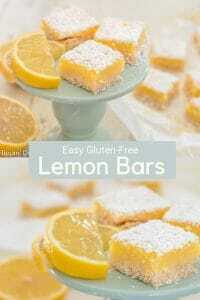 How do I make dairy free gluten free lemon bars? If you are like my family, you need a dairy free lemon bar option. I’ve made this tried and true gluten free lemon bar recipe with the full cow (all that butter) and dairy free. Both versions are great! To make gluten free dairy free lemon bars use a vegan butter substitute like palm shortening, Earth Balance or Melt. I find I get the best texture and taste if I use half palm shortening and half Earth Balance. I apologize, I do not have a substitution recommendation to make vegan gluten free lemon bars. The tradition lemon bar recipe is heavily based on eggs and I wanted to keep this recipe close for nostalgia sake. I’m working on a vegan lemon bar recipe and will share when it is ready. If you try any egg substitutes, please share! I’d love to know what worked. If you love a sweet treat that makes you pucker, I think you’ll also love my gluten free lemon crumb muffins and my grain free lemon poppy seed muffins. You’ll probably also love my friend Chrystal’s Gluten-Free Lemon Cake. She topped hers with blackberries and extra lemon zest, it looks amazing! Everything of her’s I’ve tried is amazing. Preheat the oven to 350°f and line a 9" x 13" baking pan with parchment paper or lightly grease. Cream the powdered sugar and butter together. Add the egg white and mix until smooth. Add the xanthan gum, salt, and gluten free flour and mix until you have a crumbly dough. Press into the bottom of the prepared baking pan and bake for 15-20 mins, until set and golden brown. While the crust is baking, prepare the filling by whisking all the ingredients together until smooth. Gently pour the filling into the crust once it has finished par-baking. Bake the lemon bars for 20-25 mins until the center of the pan has a slight jiggle, but the rest of the pan is set. If you can use butter, you can absolutely use it instead of the vegan butter in the crust. I used half palm shortening and half Earth Balance this time, and have also used just vegan butter. Hi Hazel, the recipe says to use the zest from 2-3 lemons. You need 2-3 lemons for the juice, so I zest the lemons as I juice them so that I don’t waste a lemon if I get enough juice from 2 lemons. Usually, I zest one lemons. Juice that lemon. Zest another lemon, juice that lemon, and then see how much juice I have. (I have a lemon reamer/juicer that collects the lemon juice in a measuring cup below.) If I need more lemon juice, I zest the third lemon. If I have enough lemon juice, then I proceed.